For our 2014 growing season, the Harvest Watch blog will feature the insights of Oklahoma Farm Bureau’s Young Farmers & Ranchers committee members. Please note: Each of the participants will be added to this page after their first post. JT and Sara, along with their three girls Mattie, Mollie,and Maccie, live in Southeast Oklahoma where JT is a Farm Loan Manager for the Farm Service Agency in McAlester and Sara works for Stuart Public Schools as a tutor and bus driver. The Bains run a 250-head cow/calf operation and 300 stockers. The family also bales hay, wheat, and silage. Derek and Mary Crain of Taloga, Oklahoma, run a small herd of cows in the Woodward, Oklahoma area. The couple is focusing on building and expanding their cattle herd. Both Derek and Mary have off-farm jobs to and aid in providing some of the needed funds to expand their farming operation. In their spare time, Derek and Mary both enjoy time with family and friends and being involved in their community. Josh and Kim Emerson live near Checotah, which is located in McIntosh County in Eastern Oklahoma. The Emersons have operated a diversified cattle, hay and order-buying operation since 1998. The Emerson’s cattle herd consists of registered Angus, Simmental, Maine-Anjou breeds, which they use to produce club calves and run their commercial cow/calf enterprise. In addition to their on-farm activities, Kim works at Armstrong Bank in Checotah, which provides her with many opportunities to get involved in local agriculture organizations and community organizations. Zac and Amy Harris operate a large scale grain and cotton farm near Hobart in southwest Oklahoma. Their main crops are wheat, soybeans, alfalfa and cotton. This young farm family and their three children also manage a 250-head mixed breed commercial cow herd. They have invested heavily in hi-tech precision agriculture methods incorporating GPS yield monitors and similar computerized gear to efficiently produce food and fiber for the American consumer. 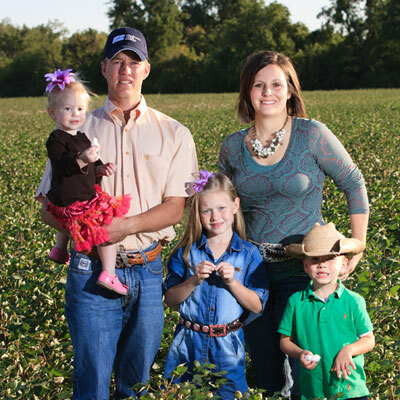 Kody & Ashley Kinder farm and work in southwest Oklahoma’s Cotton County. Both Kody and Ashley come from farm families, and they have the opportunity to help on the farm operations when possible. Kody’s family has wheat, canola, sesame, and stocker cattle. Ashley’s family’s operation consists of wheat and cattle. Both of the Kinders have off-farm jobs in addition to duties on the farm. Kody currently works for the Cotton County Sheriff’s Department and Ashley currently works for the Cotton County Farm Service Agency. River Mitchell is a fifth-generation rancher from southwest Oklahoma. River lives and works on his family’s ranch alongside his parents and brothers. River is also a full-time college student at Cameron University in Lawton, Oklahoma, and he commutes daily as he finishes his senior year. The family ranch has a commercial cow herd along with yearling cattle grazing during the winter and growing replacement heifers for a dairy operation. Clint and Jessica Wilcox farm in Northwest Oklahoma near Fairview. The couple grows wheat, canola, and grain sorghum along with a few head of cattle The Wilcoxes also run a full-service Crop Insurance Agency in Fairview, Oklahoma – both Clint and Jessica are crop insurance agents. The Wlicoxes also represent the at-large position on the Oklahoma Farm Bureau Young Farmers and Ranchers Committee this year, while residing in District 7. Marty and Crystal WIlliams have been farming in the Red Rock, Okla., area since 2004. The Williams are raising their daughter, Ava, and son, Morgan, on the farm, close to Marty’s parents who also farm in the area. Marty and Crystal raise winter wheat, winter canola, corn, soybeans, barley, grain sorghum, alfalfa, pecans, cattle, and hay. In addition to the production agriculture part of their farm, they also sell commercial soybean, corn, and sorghum seed, and Marty has a side-business that controls algae in lagoons at the Phillips 66 oil refinery in Ponca City, OK.